Home » Blog » Acrylics » Nala, a most devoted companion to a Canadian war vet. Nala, always watchful of her partner, Bosnian war vet, Dominique Brière. Recently, I was asked to paint a portrait of Nala, a service dog for one of our Canadian war vets. Gentle and with a sweet disposition, Nala can intuitively detect when Dominique is feeling stressed. As you will see, she is indeed, a very special dog. Dominique Brière was only 21 years old when he volunteered to go on a peace mission to Bosnia with the Blue Berets, Canadian soldiers on UN service. The day he arrived in Sarajevo, Dominique from Gatineau, Québec, quickly realized there was no peace to uphold. In fact, in April 1992, three Bosnian groups, the Bosnian Muslims, the Serbs, and the Croats were already fighting it out on the streets of Sarajevo. The ethnic cleansing came soon after. Featured in a CBC documentary in 2018 (RDI – Ottawa-Gatineau), Dominique and four other soldiers from his regiment returned to Bosnia, and more specifically, the areas to which they were assigned 25 years earlier. The documentary, Faire la paix avec la guerre, (Make peace with war) is a mix of news clips from the 1990s, personal videos, and actual footage of their recent 2018 trip. All in their late teens to early twenties, the five soldiers witnessed atrocities that became seared in their memories. The horrific images have haunted them many times since their deployment 25 years ago. From Sniper Alley in Sarajevo, to Visoko and the Canadian military barracks where they were stationed, to the hospital in Drin where patients were abandoned and left to die, the five men relive their tour of duty in a very emotional visit. Most particularly, Dominique remembers helping a woman in Srebrenica give birth when he was only 21 years old. As he states in the documentary, he wasn't a medic and had no experience whatsoever in birthing a child. In 1993, when he returned to Srebrenica, the baby's father told him that his boy had been named Dominique. In 1995 the worst mass murder in Europe since WWII occurred in Srebrenica when 20,000 civilians were expelled and more than 7,000 Bosnian Muslim boys and men were murdered by Bosnian Serb forces. Dominique has thought of that child many times over the passing years. The documentary ends with the men meeting once again in Canada, in September 2018. Another very poignant moment occurs in the last 10 minutes of the documentary. While on his tour of duty in Bosnia, a Canadian soldier adopted a one year old boy from the hospital in Drin and brought him to safety in Canada. Now in his twenties, Boris is a captain in the Canadian Armed Forces. PTSD – the invisible injuries. After soldiers and war correspondents leave the war fields, they might suffer several different symptoms that can all be attributed to events they witnessed while on active duty. When Dominique returned to Canada, the birth of his first son triggered his PTSD. His tour of duty in Bosnia and all the atrocities he saw came back to haunt him. PTSD has existed under several different names since ancient Greece. Not so long ago, soldiers suffered “shell shock” or “combat fatigue”. The term Post Traumatic Stress Disorder was coined in the 1980s. It has been gaining much needed attention in recent years as more scientific research is conducted. In Canada, 10% of returning war zone personnel suffer from PTSD according to Veterans Canada. PTSD can manifest itself in different ways in varying intensity over time. As the years went by, Dominique’s symptoms worsened. Nala as a puppy with Dominique. In 2018, at 46 years old, Dominique had to retire from his government job. He and his wife, Julie, who is very allergic to animals, were convinced a service dog would help lessen Dominique's anxiety. After much research about various hypoallergenic breeds, the couple decided a Portuguese Water Dog would best suit both their needs. Dominique and Julie found Nala, or rather, as Julie says, Nala found them. She was the calmest puppy in the litter. Nala arrived in their home in March 2018. Through Audeamus, a registered charitable organization, Dominique and Nala have participated in specific training so that Nala can help Dominique when he is feeling anxious. In all likelihood, no matter which organization provides the service dog, a Canadian vet will have to wait for possibly up to two years for his or her service dog. Training the dogs takes time, and then matching the dog to the owner also adds to the wait. The following information is provided from their website should you wish to donate and help more Canadian war vets partner with a service dog like Nala. AUDEAMUS provides certified, specially trained service dogs and on going support to people suffering from mental or physical disabilities to relieve conditions associated with disability with a view to improving their independence as well as their physical and emotional well-being. Disabilities served include, but are not limited to, brain injured veterans, first responders and war correspondents. AUDEAMUS, Latin for "MAY WE DARE", is a registered charity operating throughout Canada [Reg#: 762071298RR0001]. It is 100% volunteer and veteran-run and directed. We have minimal expenses, which ensures that donations made toward AUDEAMUS go directly to supporting our veterans, first responders, and war correspondents. Nala and Dominique are participating in a University of Saskatoon research program to study the benefits of therapy dogs for veterans suffering from PTSD. The research question is: Does an AUDEAMUS service dog assist veterans with PTSD in addressing their problematic substance use, and specifically opiates? And if so, how, accounting for both the tasks the dogs perform and their connection with the veteran? We are testing physiological measures with both the veterans and service dogs through wearable technology as well as psycho-social-spiritual measures with the veterans and their family and health care providers. A charitable donation will be made to Audeamus for all pet portrait commissions over $150.00. Dominique and Nala and custom pet portrait. Nala on duty: DO NOT TOUCH! Portuguese Water Dogs are "easy to train, super-smart and very 'biddable' - meaning eager to please." Always alert for any cues her partner might give her, Nala is on duty whenever she is with Dominique. Her entire focus must be on Dominique even when there are interesting distractions nearby. When she sees that her partner is anxious or stressed, she will seek his attention particularly for hugs that will calm him. She reminds Dominique in many different and often subtle ways, that she is always there for him. Nala is very much devoted to helping him live a more enjoyable, healthy life. Nala and Dominique during the Army Run in September 2018 in Ottawa, Canada. 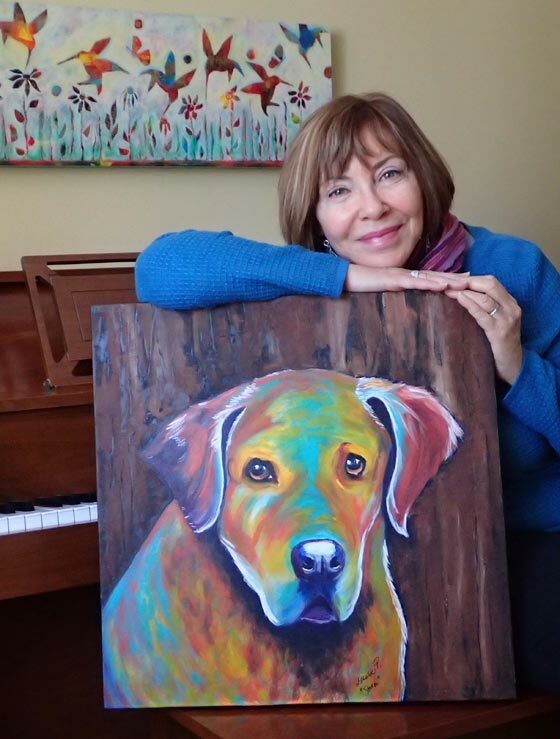 Contact me if you would like to have your special furry companion painted by me. I love painting animals and I am always pleased to receive special requests. I have openings for June at the present time. Fall is a busy period as Christmas orders begin to arrive in my email box. I limit the number of commissions I accept because painting a meaningful pet portrait can be a lengthy process with much consultation with the client. I work from photos that you send me online. Contact me if you have any questions. Visit my Custom Pet Portrait page and my wood slice pet portraits. Scroll down (after the WIP photos) to see a few photos of Sarajevo taken in September 2018 when I travelled to Bosnia-Herzegovina, Croatia, and Montenegro. Subscribe to my newsletter to receive the free ebook travelogue (available only to my subscribers) with photos of the entire trip. WIP. First idea for background – stamping maple leaves. I didn’t like the effect but the client was happy with this idea and encouraged me to give it a go. WIP. I take many photos comparing my painting with the photos. Some of the photos are sent to my clients for their feedback. AHA moment occurred in the middle of the night. I would use pressed leaves from last fall on my gelli plate for the background. Cutting the delicate paper so that the leaves can be collaged onto the background. Placing leaves in different ways. Nala, a devoted service dog to Canadian war vet Dominique Brière. After a final photo with the portrait, this one is ready for delivery. Destroyed by war, this building has been left as is. I think we were told that this was originally built as a community centre and apartments for senior citizens. It now serves as a reminder of the Bosnian war. Pock marks from bullets are still visible on balconies and near the roof on these buildings on Sniper Alley in Sarajevo. It is impossible to miss as so many buildings still have all the holes left from the bullets. Suggested reading: Zlata's Diary: A Child's Life in Wartime Sarajevo by Zlata Filipovic. Zlata's diary gained much attention in the 1990s and became an international bestseller. Often compared to The Diary of Anne Frank (and Zlata hoped not to end her life as Anne Frank did), Zlata is a witness to the destruction of lives and of her beautiful city. Her diary was originally published by UNICEF. She and her family escaped to Paris. While this novel is classified as YA literature, it does give us one view of a world turned topsy turvy. (It is sweet and fitting to die for one's country). Now it's your turn!..Share an anecdote (in the box below) of a place that you have visited that has had an impact on you as Sarajevo did for me. I would love to hear about it!